JURASSIC Park author Michael Crichton says if you don’t know history, then you don’t know anything – you are a leaf that doesn’t know it’s part of a tree. Local Chinese writer Chai Kit Siang shares this philosophy of Crichton’s and translates it into action by voluntarily organising heritage walks to “discover” some of the historical sites and streets of Kuching. On July 5, the 38-year-old and another volunteer, Joshua Chan, 49, arranged yet another such exploratory trek into one of the oldest streets in old town Kuching – Carpenter Street. The excursion started from the Old Court House and ended at Hong San Temple. “To know one’s origin is to know the city one dwells in. To know the city is to know the history of the streets. To know the streets is to know the life of the people. And to know the life of the people means to respect them,” Chai said. When passing by the Clock Tower next, take a close look at its face. You will notice something different. Most locals can recognise the Old Court House from a distance but very few know it from within. One of the best preserved remnants of British colonial rule, the Old Court House consists of a few structures, built over a period of time by different people, including the White Rajahs, members of the Chinese community as well as the Japanese. The three buildings facing the Kuching Waterfront were the first to be built in 1874. Over the years, they were expanded with more structures and monuments, including the Clock Tower, built by second White Rajah, Charles Brooke, in 1883. The cluster of old colonial buildings, known generally as the Sarawak Tourism Complex now, housed more than just the judiciary in the old days. They doubled up as the government legislative and administrative centres. The Chinese community of all dialectal groups used to call the place Po Le Tin – the Chamber of Po Le. There are generally two theories behind the origin of Po Le. The first is that since most buildings at that time were either made of wood or attap, the Old Court House which had some glass panels, was called Po Le Tin – Po Le stands for glass in all Chinese dialects. According to the second theory, Po Le Tin was used because there were always some policemen guarding the place. And the term Po Le may have been derived from the word police. What is even a greater mystery is that not only all Chinese dialectal groups in Kuching in the old days called government offices Po Le Tin, the Chinese communities in Singapore and Kuala Lumpur also used the same term to refer to office buildings. While the first Rajah James Brooke operated from the Astana across the Sarawak River, his successor Charles Brooke worked from the Old Court House where most of the official functions were held. It was during the rule of Charles that by-laws such as delineating five-foot ways for shoplots and prohibiting animals from loitering at such areas were set. 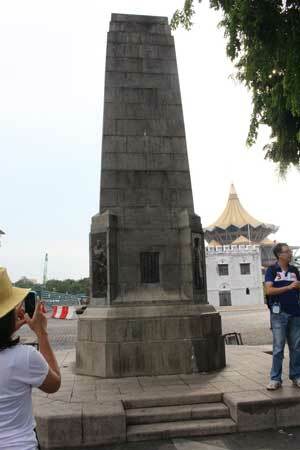 Another unique structure of the Old Court House is the obelisk monument, built by the Third White Rajah Charles Vyner Brooke in memory of Charles Brooke, with donations collected from the public, including the Chinese community. As the collections exceeded the building costs, the balance was used to set up the leprosy centre – Raja Charles Brooke Memorial Hospital at Mile 13 Kuching-Serian Road. Locals liked to name places on the outskirt and beyond according to their distance from the town – such as 7th Mile, 10th Mile and so on. The question is where does the kilometre zero or mile zero marker (for measuring the distance) start? 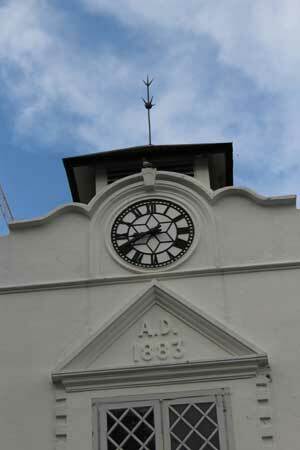 Traditionally, it is believed for Kuching, the mile zero marker is at the centre of the courtyard of the Old Court House. In its place used to be a big old tree which was later struck down by lightning. Now, a unique art piece, whose creator is not known, takes the place of the old tree. During the Japanese occupation, a new building was added to the Old Court House that now houses a Middle Eastern restaurant called Little Lebanon. Min Heng Coffee Shop can be easily missed by both locals and tourists alike. It has neither an attractive interior nor any popular dishes on its menu. For those well-versed with the history of this part of Kuching city, Min Heng still retains not only the original structure of a shop built a century ago but also that of a Hainanese coffeeshop. The present slew of coffeeshops that have become part of the scene in Kuching city are actually old Hainanese coffeeshops which have been given a “modern” makeover. 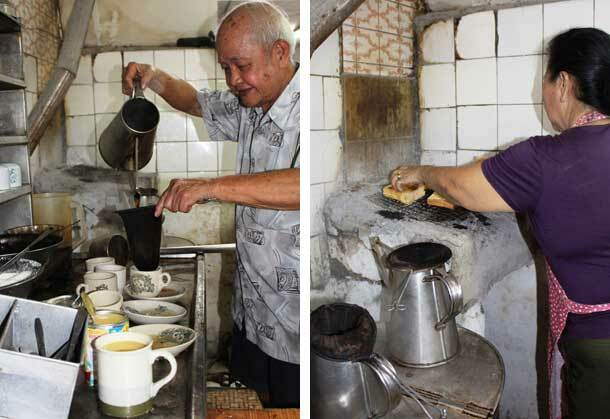 Although early Chinese immigrants were more tea than coffee drinkers, the Hainanese managed to parlay their coffee-making prowess into a thriving beverage business and, in the process, created a coffeeshop culture that has stood the test of time. The Hainanese came to Kuching later than the Hakka, Hokkien and Teochew. As the three latter groups had taken up most of the jobs and controlled the trading of all the commodities, the Hainanese were left with limited choices. Most ended up as domestic helpers of colonial officers – and even earlier immigrants of nyonyas and babas. It was while doing such household work that the Hainanese picked up the skills of making coffee, kaya, bread, curry and, most famously, chicken rice. Later, when starting their own coffeeshop business, the Hainanese “asim” (domestic helpers) put into profitable use what they had learnt in their masters’ kitchens – coffee and toast with kaya or butter, curry (using tapioca flour rather than coconut milk or milk) and the exclusive Hainanese chicken rice. In the early days when there were no coffeeshops, sellers of Kuching’s traditional dishes such laksa and kolok mee were all “mobile” vendors who either used a bamboo pole or a trishaw to transport their loads of utensils – and even stoves. Gradually, the “mobile” vendors were invited to sell at the coffeeshops which, over the years, have evolved into the eateries we see everywhere today. Min Heng, built more than 80 years ago, still maintains some physical features of the old shop it once was – such as the interior open air courtyard which, according to Chai, was built for three purposes – ventilation, light and collecting rainwater. Apart from keeping some of its physical features and the old way of toasting bread over charcoal fire, Min Heng is also said to be the birthplace of Kuching laksa. Teochew immigrant Goh Lik Teck was a cook in China capable of serving up 12 different dishes comprising longbeans. And from their delectable taste, diners would not be able to tell the original ingredients were, in fact, cheap longbeans. After settling down in Kuching, Goh started a small food business – and was usually creditted as the brain behind Min Heng’s top seller at that time – Kuching laksa. He did this by using a mixture of over 30 ingredients. And he started plying his ware in 1943 – initially as a mobile vendor. Then with the advent of Hainanese coffeeshops, Goh saw the opportunity to open a food stall at Min Heng and he seized it by introducing his laksa (with multiple incredients) to the public who thronged the premises for breakfast and lunch. To nobody’s surprise, his creation – Kuching laksa – quickly gained fame as a must-have dish. “I don’t know when my father started to operate at Min Heng. All I know is we obtained our licence in 1957 and I still have it with me,” Poh Chuan, 63, son of Lik Teck, told thesundaypost. 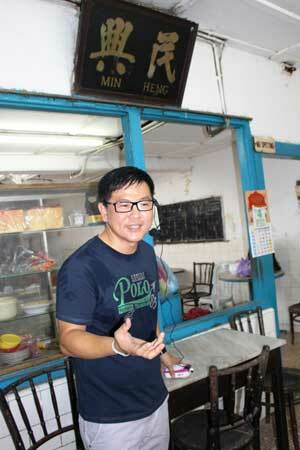 Poh Chuan who took over the laksa business from his father at Min Heng, has called it a day. He carries on the family legacy by selling laksa paste from home near Kuching International Airport. Joshua Chan explaining the history behind the dishes at Min Heng Coffee Shop. The first Siang Ti Temple was built by the Teochew in 1863 but it was later razed to the ground. A new temple was erected at Carpenter Street in 1889. Traditionally, a Chinese opera theatre must be built directly opposite a temple so that every first day or middle of the month, a Chinese opera could be staged as a thanksgiving to the deities. The opera is also open to the public. The proper name for the theatre at Siang Ti Temple is Yang Choon Tai – the Theatre of Yang Choon – although now, it’s more commonly known as Lao Yea Keng or Chamber of the Lords. The Teochew have the custom of addressing people they respect as lao yea or sir. It’s believed the Teochew also address the deities as lao yea as a mark of reverence. Hence, the Chinese opera theatre of the temper at Carpenter Street now assumes the name of Lao Yea Keng. To this very day, Lao Yea Keng occasionally still stages Chinese opera, especially on the birthday of the deity – Hiang Thian Siang Ti – or other auspicious festivals. The areas around Carpenter Street boast the most popular eating outlets in Kuching. This is not surprising as the dishes sold there such as kuah chap, Teochew muay (porridge) and kolok mee are all dishes with more than 60 years of history behind them and which the stall owners have passed on from one generation to the next. A Chinese opera theatre could also be used as a sanctuary or refuge for the downtrodden and homeless. Without a welfare system of any kind in the old days, Chinese immigrants who first arrived in Kuching and had no relatives or benevolent associations to turn to, could actually sleep under the stage until they were able to find own board and lodging. While there are many stories of Chinese immigrants carving out a successful life for themsleves here, so also are there many instances of Chinese immigrants returning to China disease-ridden, miserable and broke. For example in the early 1900’s, a Foochow immigrant arrived in Kuching and for over a decade, he toiled and managed to save RM350 which he planned to start a business with. But World War II broke out, lasting three years and eight months, and put paid to his plan. By the time the Japanese left, he was already in his 60’s and at that age, the prospects of starting afresh looked dim. Impoverished and homeless, he found temporary refuge at a Chinese opera theatre, widely believed to belong to Hong San Temple. In 1948, he managed to raise enough boat fare to return to China. There were many who suffered the same fate but there were also the thrill seekers and the happy-go-lucky who succumbed to lures of brothels, opium houses and gambling joints at the back alleys of Carpenter Street. Not all Chinese immigrants brought the bacon home. It was never a bed of roses for the early Chinese immigrants. Back then, a sea trip from China to Sarawak took 30 days. Many died on the way and were thrown overboard to prevent diseases spreading to the other passengers. For those who managed to reach here, there were some big challenges as well – the heat, the harsh forested environment, the endemic pestilence, especially mosquito-borne diseases, and the fear of head-hunters. To ensure Chinese labourers he imported from temperate China remained healthy and productive, Charles Brooke decree that a cannon be fired from the Astana at 5am and 8pm everyday to remind them to keep clean by taking a bath. 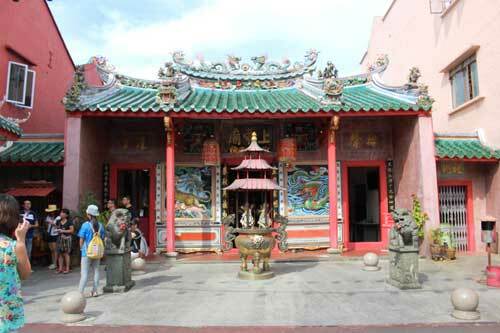 It is believed there are three wells in the old part of Kuching – at Tua Pek Kong Temple (Main Bazaar), the Chinese History Museum at Kuching Waterfront and Upper China Street, an alley of Carpenter Street. Official documents date the presence of Chinese in Kuching back to as early as 1839 when there were over 20 of these pioneers opening up vegetable farms at Satok area. It was later that the Hokkiens, Teochews and Hakkas started arriving in droves. A stroll down memory lane along the Carpenter Street with Chai and Chan is a stroll through time. Revisiting the historical streets and backalleys that hold the many secrets of the early Chinese immigrants is historically enlightening and exhilarating but sad at the same time. It serves as a poignant reminder of the pain and suffering the early immigrants had to put up with in order to survive. The descendants of early Chinese immigrants are able to get where they are today because of the virtues of diligence, perseverance and thrift. With life so much better now, most of the succeeding generations of Chinese tend to forget the very virtues that had made their forefathers successful. Perhaps taking a stroll down some of the old streets in Kuching can serve as a wake-up call for the Chinese community to the humble beginnings of their ancestors as well as the city.